Yesterday I was doing some stitch outs for new banners on my website. I decided to stitch out a combination of designs from Natalie’s Wedding Day collection, in my 8″ square hoop which is my favourite. I opted for a slubby ivory silk dupion and after much deliberation went for one of my favourite greens, light putty, Sulky 1229. Now I decided to put the same thread in my bobbin so that there would be no show through on the embroidery which was going to be photographed in macro mode. I also slowed my machine down by 2 degrees as advised by my friend, Pamela Cox. So everything was looking very good. Imagine my horror when the machine stopped in the middle of a large satin leaf. Now I always say that you need to stop and look at your embroidery when this happens as your stitch out may be compromised if you just put in a new bobbin and carry on. In this instance I set the machine back quite a few stitches so that there would be some overlap. 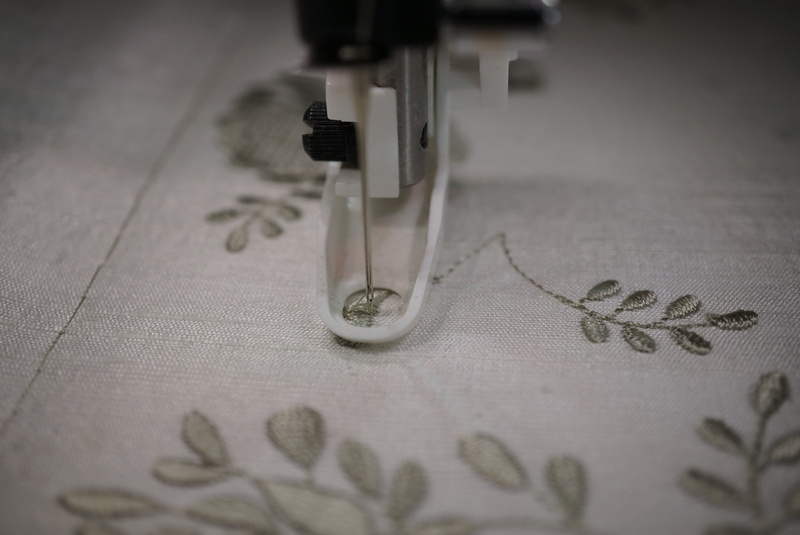 It is also a good thing to keep the thread ends so they can be placed at the back of the embroidery and secured afterwards especially if the satin stitches are large. Then there is no danger of your embroidery coming undone. 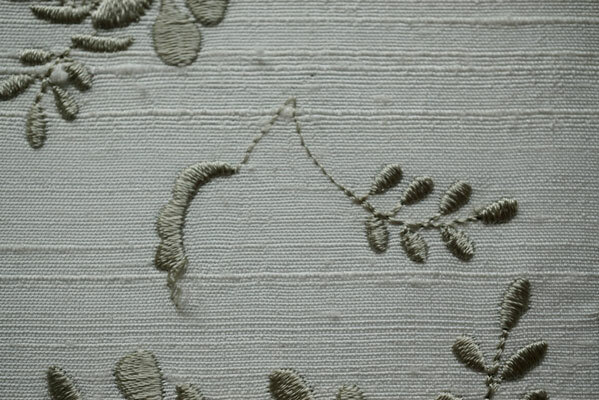 Here you can see the join which is not visible when looking at the embroidery overall. I continued the embroidery stitch out and then removed it from the hoop. As I had used two layers of stitch and tear stabiliser, I removed one layer and then the other, to reduce the pull on the delicate stitches. 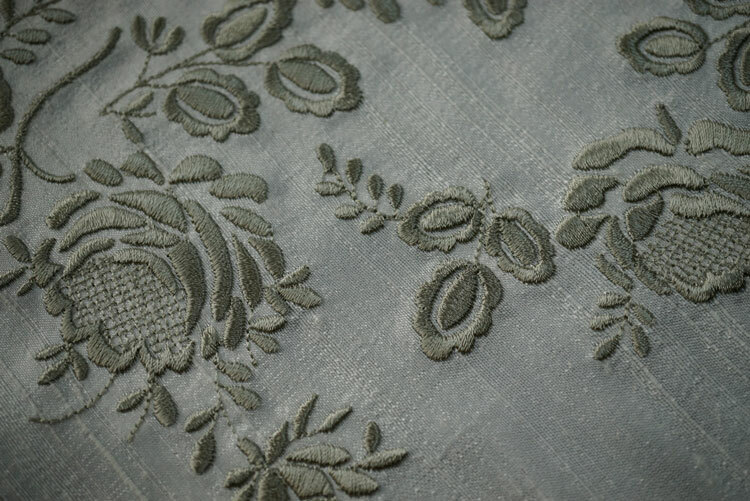 Here is a close up of the finished embroidery after the stabiliser has been removed, and the embroidery has been set by steaming carefully on the back into a terry towel. Most of the stabiliser was removed and all the jump threads were snipped so there was no danger of them pulling and causing puckering. Here is my photo edited for a new banner on the website. 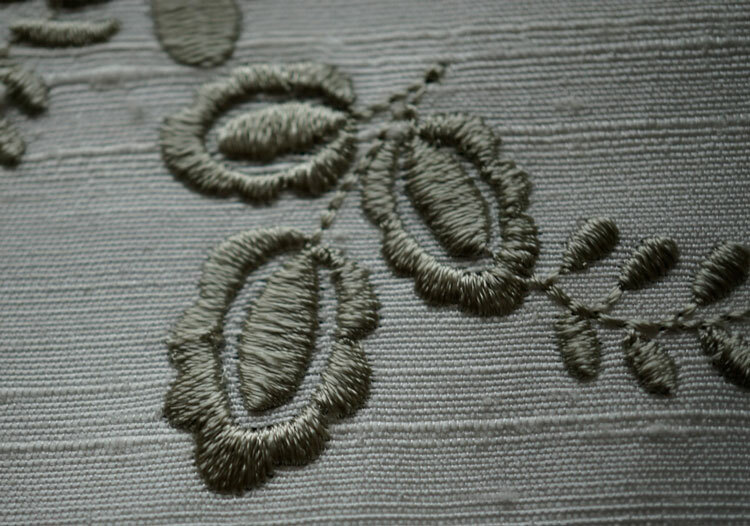 This entry was posted in Discussing machine embroidery and tagged Avoiding puckering, embroidery on silk, machine embroidery, Solving stitch out problems. Bookmark the permalink.